As many times before I used my car as a mobile blind while watching for birds and taking pictures in the Green Island Wetlands yesterday. The Hooded Mergansers are usually very shy and take off quite often even before the car comes to a standstill. But love is in the air already and I watched several males competing for the attention of a female. This is our chance to make a successful click because they are distracted. 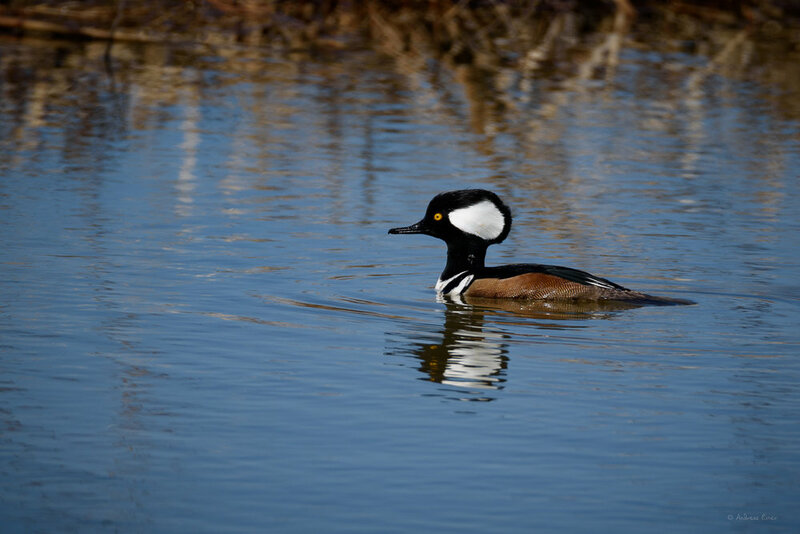 The Hooded Merganser is the smallest of the three species found in North America. They find their prey underwater by sight. A third eyelid, the nictitating membrane, is clear and protects the eye during swimming. Beside aquatic insects, crustacians, frogs, plants and seeds, they feed on fish, capturing them with their serrated and hooked bill (see photo). More to come…please stay tuned!